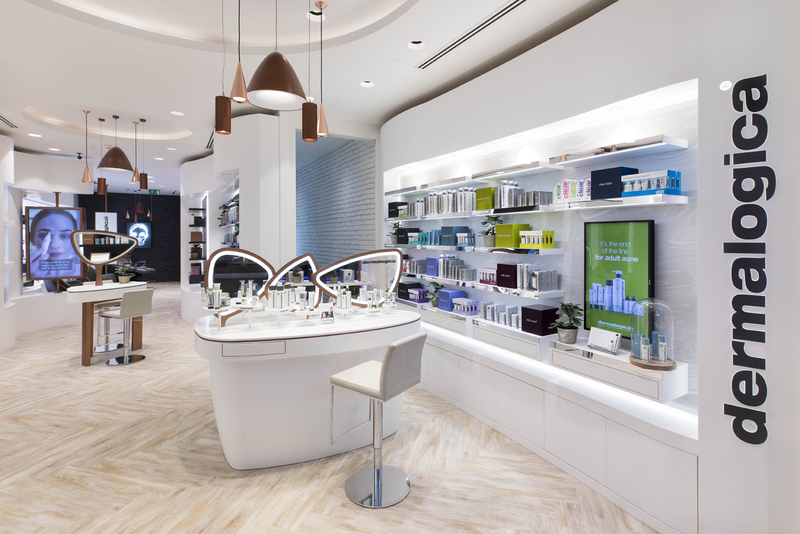 For more information on how Limeblue can help your store achieve its full potential, please call us on 01428 651878. 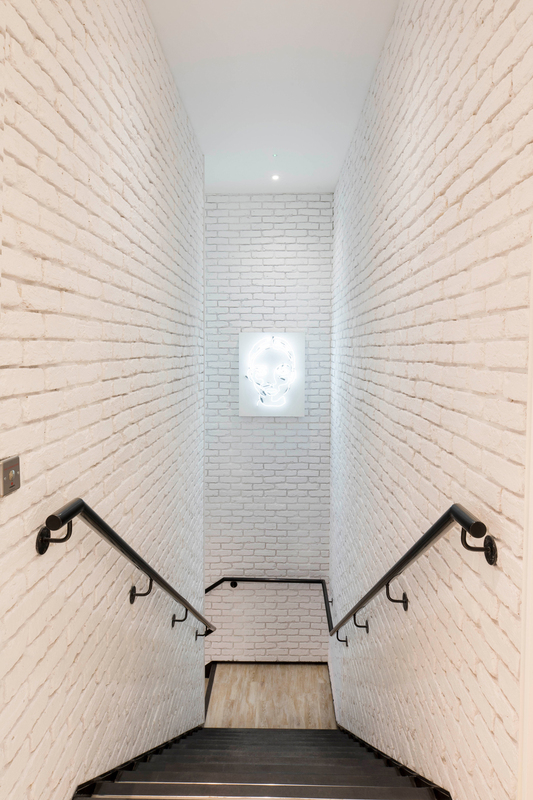 Alternatively, you can fill in an enquiry form located on our Contact Us page. 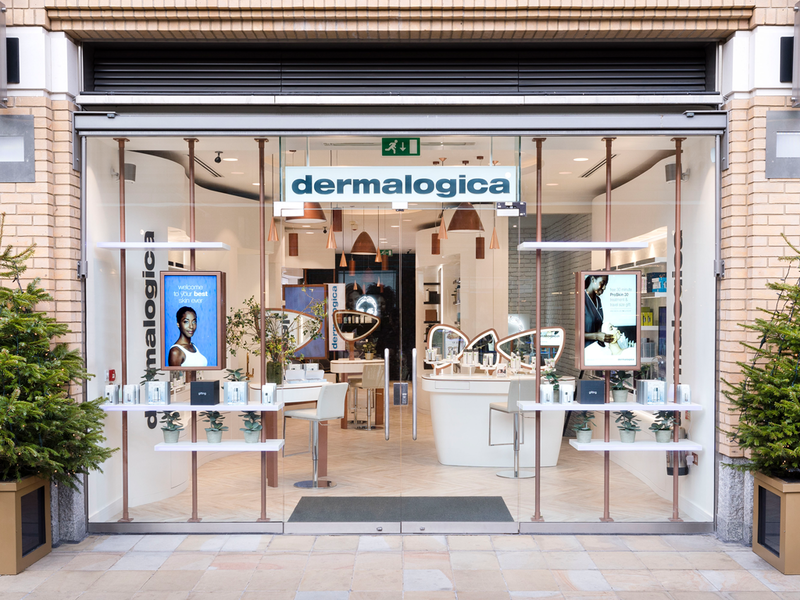 Limeblue designs Dermalogica’s largest UK flagship store in London’s Duke of York Square. 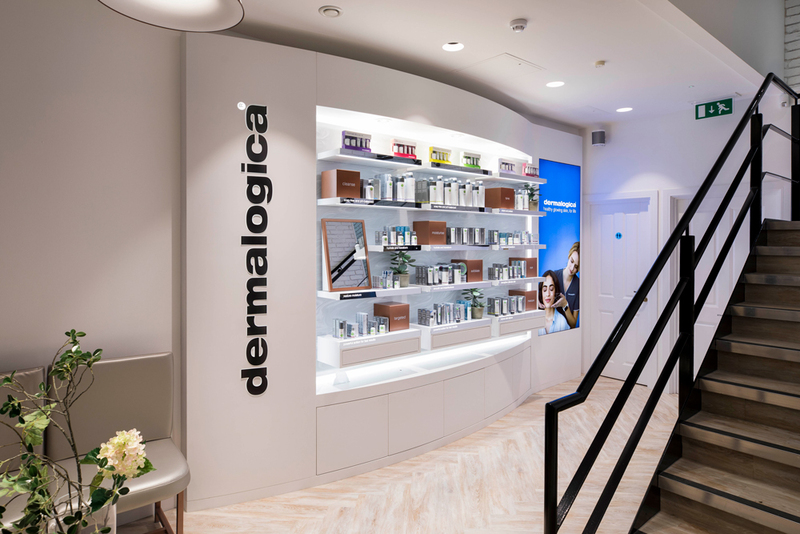 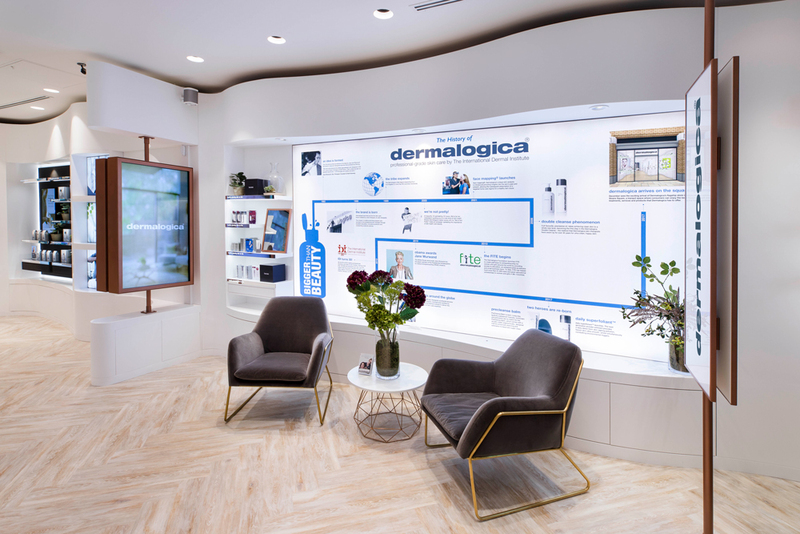 Limeblue have designed long-standing client, Dermalogica’s new and largest UK flagship store in London’s Duke of York Square, creating a multi-sensory environment that fully engages the customer via sight, sense and touch. 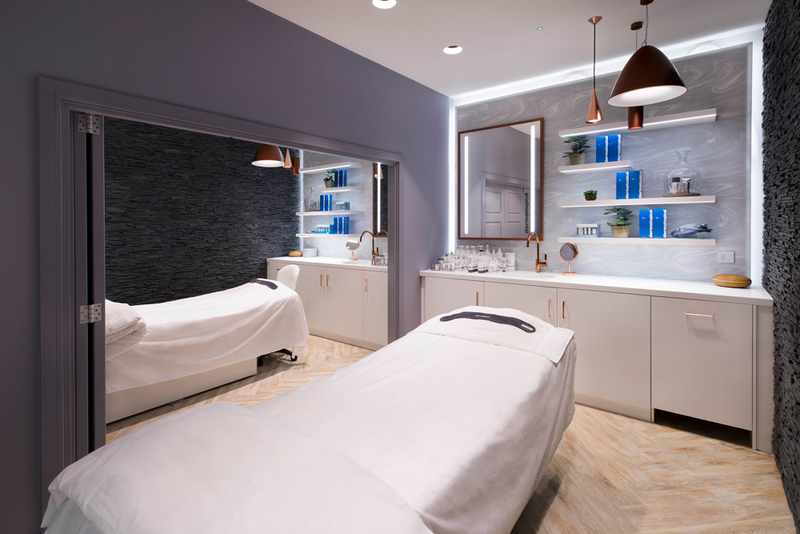 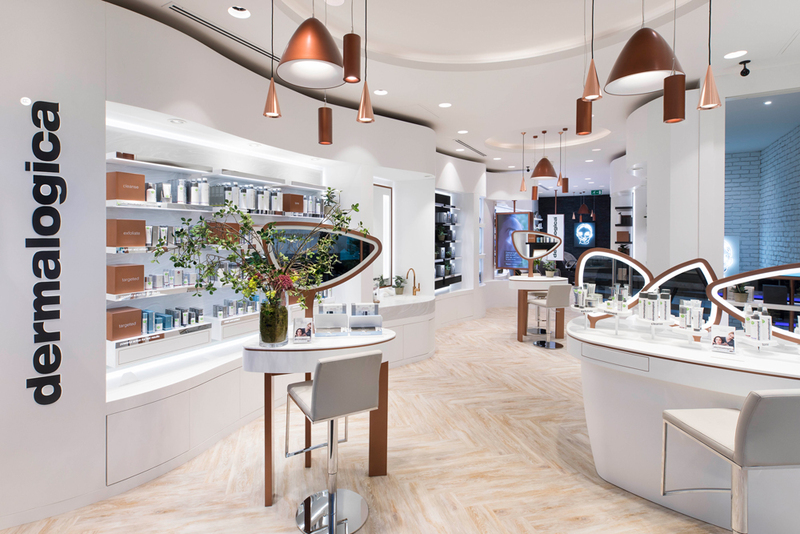 The 1,500 square foot space was designed into clearly defined areas for retail, skincare treatments and consultations. 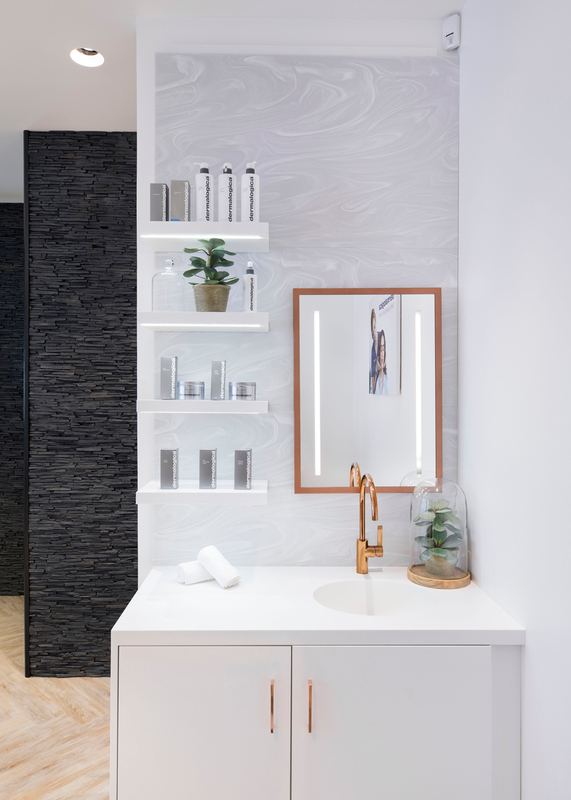 The coherent design scheme was achieved through the use of sleek white curves, contrasting textures and materials, touch screen technology and unique lighting systems. 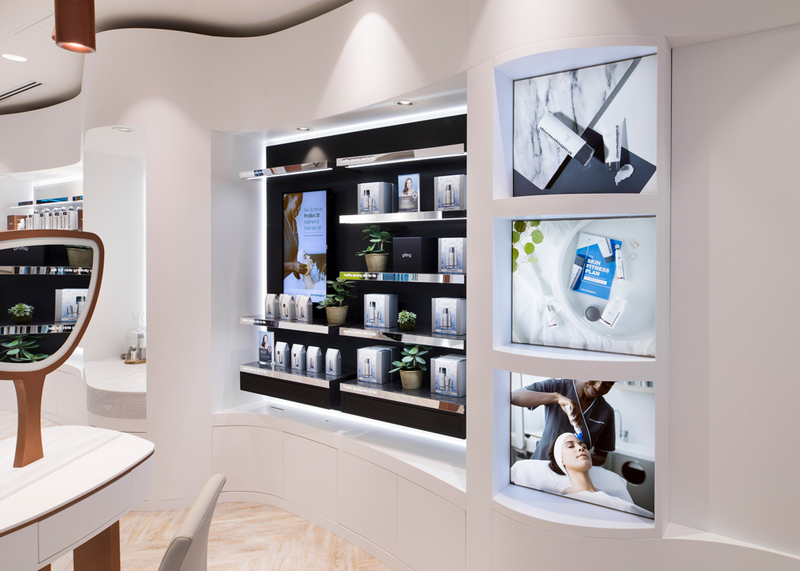 The interactive Skin Bars and curved product display units are constructed with high-quality Corian. 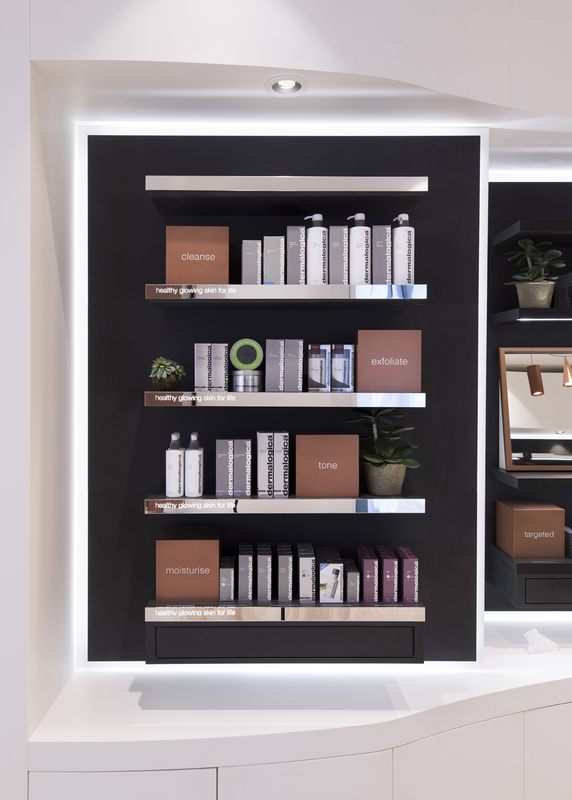 Copper detailing around the mirrors and matching copper pendant lights throughout the store contain a unique filter control system known as ‘Beauty’ from Targetti, which gives the skin a natural and healthy glow. 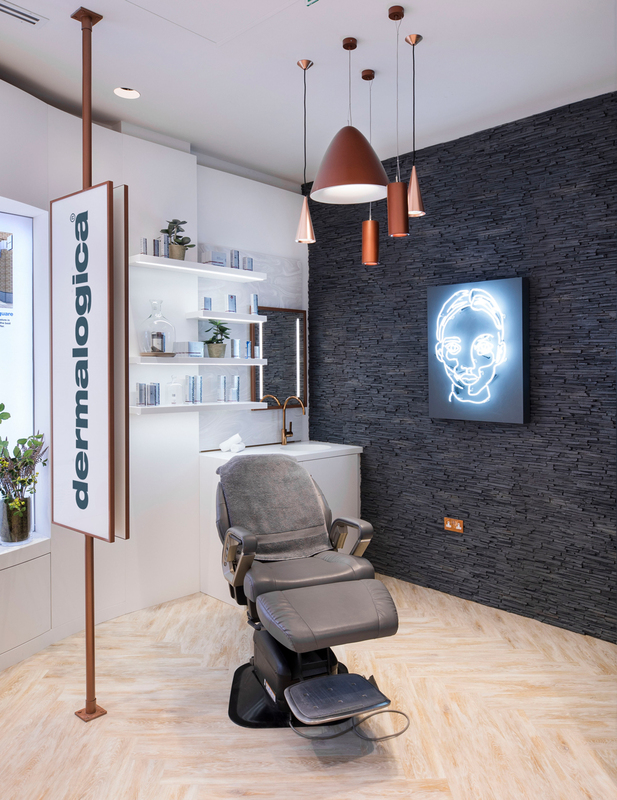 The walls consist of a textured ‘Panelstone’ slate-effect and white brick-effect from PanelPiedra, and a wood-effect limewashed chevron flooring covers the entire floor area giving the store a warm and homely touch. 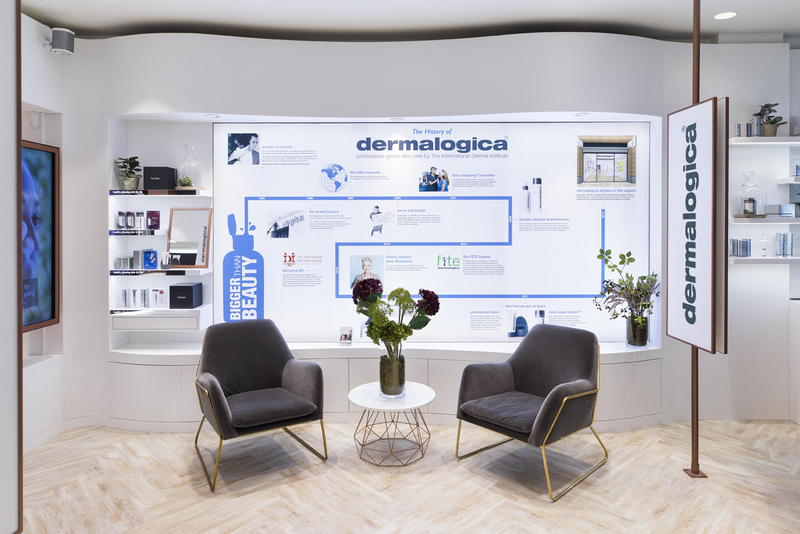 The bespoke furniture has been designed so it can be easily adapted to allow for hosting events and decorative items, such as cloches and plants have been positioned around the store to help break up the overall space and make the products more distinguished and attractive. 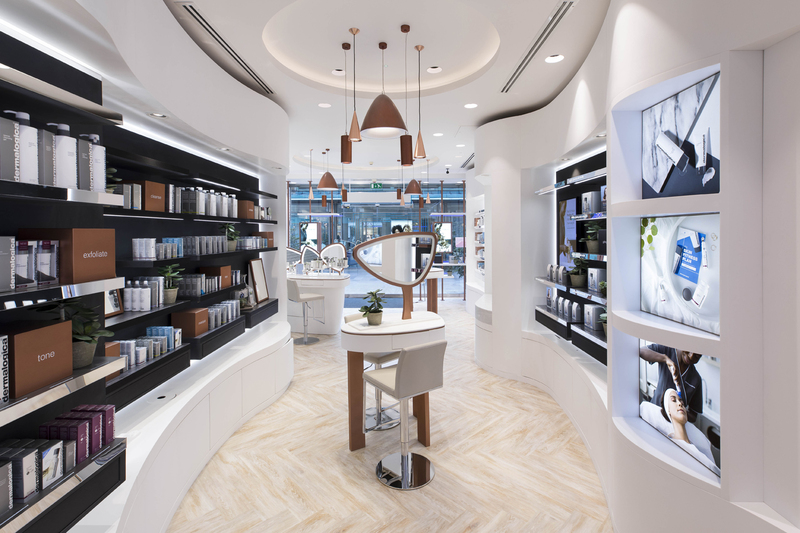 Launched in December 2017, the flagship store has a welcoming, luxurious environment that gives the customer a feeling of exclusivity and wellbeing.